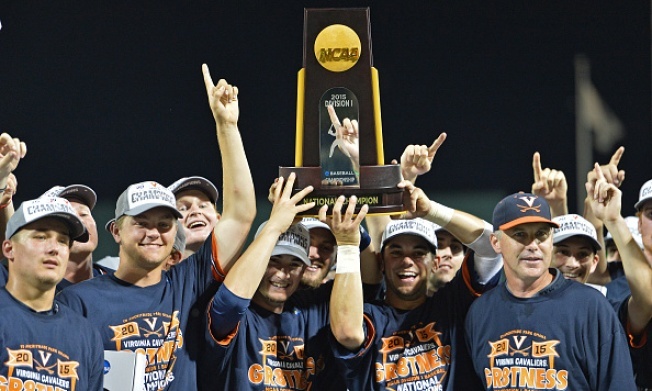 It took 60 years, but the Atlantic Coast Conference finally won a baseball national title again. Virginia completed its improbable run to the championship with a 4-2 victory over defending champ Vanderbilt on Wednesday night, making it the first ACC team since Wake Forest in 1955 to reach the top of college baseball. It had been a curious drought for the ACC. Only the Pac-12 and Southeastern Conference have sent more teams to the College World Series. "It's amazing the text messages I received over the last couple of days from other coaches in our league rooting us on,'' Virginia coach Brian O'Connor said. "We've never discussed in our program about one league against another or us trying as a league to get over this hump and winning a national championship. SURPRISE TITLE: Six weeks ago, it looked as though Virginia (44-24) might not even qualify for the 10-team ACC tournament, let alone the NCAA Tournament. The Cavaliers dealt with a spate of injuries, went 18-18 in March and April and didn't secure a spot in the conference tournament until the last weekend of the regular season. They were a No. 3 regional seed in the NCAA Tournament. Virginia's 44 wins were the fewest by a national champion since the 1968 Southern California squad had 43. FANTASTIC FRESHMEN: Second baseman Ernie Clement came up big in super regionals against Maryland. Adam Haseley, who usually plays center field, was the star of Game 2 of the finals when he pitched five shutout innings in his first start on the mound since May 23. First baseman Pavin Smith was the next freshman to make a huge contribution, hitting a two-run homer and singling in the go-ahead run on Wednesday night. He also flashed a great glove. Smith had gone 1 for 8 and struck out four times in the first two games of the finals. HAPPY HOMECOMING: For O'Connor, the championship had added significance because it was won in the city where he was born. O'Connor was raised across the Missouri River in Council Bluffs, Iowa, and pitched in the 1991 CWS for Creighton, which is a few blocks from TD Ameritrade Park. DOMINANT PITCHERS: CWS Most Outstanding Player Josh Sborz was nails. He won three games and pitched 13 scoreless innings in Omaha and didn't give up an earned run in his last 27 innings this season. Brandon Waddell (5-5) went seven innings Wednesday and allowed only two hits after Vanderbilt scored twice in the first. He retired the last 11 batters he faced in his third CWS start and fifth of his career. Virginia won each of them. Nathan Kirby, who missed nine weeks because of injury and returned to start a game in the CWS, pitched the last two innings and struck out five of his eight batters for his first save. VANDY'S NARROW MISS: Vanderbilt just missed becoming the third team in the last 10 years to repeat as national champion. John Kilichowski (3-4), who relieved starter Walker Buehler in the fourth inning, took the loss in Game 3. The Commodores (51-21) had a second straight season with more than 50 wins, and they came into Wednesday having outscored their first nine NCAA Tournament opponents 70-15. They couldn't generate much after scoring their two runs in the first and went scoreless in 18 of the last 19 innings of the finals.